Wieland and colleagues also showed that alternative strategies can work. Basically, scientists need to choose a different molecule on their target cells that is abundant enough to avoid being covered up by immune complexes. However, when designing antibodies for use in translational or clinical studies, sometimes it will not make sense to shift gears in this way. 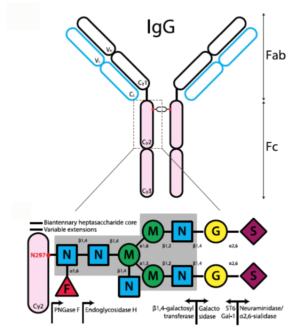 It is possible to engineer antibodies’ production in culture so that they lack fucosylation. Wieland says that the biotechnology field is moving toward therapeutic antibodies that lack fucosylation or are otherwise modified to interact better with Fc gamma receptors, because these newer antibodies are more effective, milligram per milligram. Here is a recent review on the topic. Rituximab, for example, is fucosylated but a second-generation version lacking fucosylation (obinutuzumab) was FDA-approved in 2013. Beyond rituximab, the Emory team’s findings have implications for treating other forms of cancer and autoimmune diseases in the context of chronic infections, or other situations, such as systemic lupus erythematosus, when immune complexes might interfere with therapeutic antibodies.